“Kelly’s fast-paced novel takes the reader on a flight of fancy couched in realistic, straight-forward and graceful prose that makes the fantastic utterly believable. It’s hard to stop reading...fasten your seat belt for an enjoyable flight." “The strong voice speaking from the pages of Winged, by April Kelly, immediately captures both interest and sympathy…with cliffhangers that keep the reader turning pages breathlessly. This perfectly crafted Hollywood murder peels back the curtain on not one, but two worlds, giving the reader a glimpse into the glamour of show business and the slow grind of down-and-dirty police work, blending the two domains in clever metatextual ways. Plenty of snappy banter and clenched-jaw exposition...all the intrigue of Hollywood’s big-budget blockbusters. 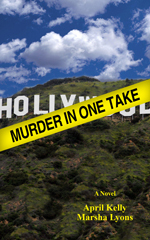 Kelly and Lyons return to their distinctive brand of mystery starring the LA-Based duo (Maureen O’Brien and Blake Ervansky) who combine traditional investigation with the Hollywood perspective. Darker than its predecessor, this installment doesn’t sacrifice the humor or turns of phrase that were the hallmarks of the first. Tight and sharp-witted.